Repaired cedar siding on our home, painted the entire outside of the house with cedar stain, power washed and stained our deck, painted all trim, exterior doors, and gutters/downspouts. "David Wockenfuss and his crew provided excellent service, quality of workmanship, and customer service. We would not hesitate to use them again, or to give a glowing referral to this company to anyone who is considering exterior painting. We have a large home with cedar siding that is about 20 years old, and from the start of his assessment, Mr. Wockenfuss pointed out the areas of the cedar siding that could be repaired, and those that needed to be replaced before painting. Several other painters that we got estimates from did not even identify these areas as problematic, and when we asked about them, said that we would have to hire someone else to do the woodwork, and did not really address our concerns. The overall price that was offered to us from Wockenfuss came in at a very competitive rate, but included the woodwork and repairs, as well as the power washing and staining of our deck---and an Angie's list discount! His crew showed up reliably and consistently on time, were courteous and helpful, worked very hard during very hot days, and did excellent work. Their attention to detail was impressive, given some of the other experiences we have had with contractors and painting crews doing work at our home, and David provided the needed oversight, and checked up routinely on the job and the progress of the work. We had a bit of a delay at the start of the job that involved getting approval from our HA on the color of the stain, and Mr. Wockenfuss was as patient as I think anyone could be with that process. He followed up with us about a week after the job was done to make sure that all went well, and offered to fix anything that we were not happy with---which was also a pleasant surprise, as we have had many contractors provide no follow up whatsoever after the job is done and paid for. As it happened, a small piece of masking tape was accidentally left on our large bay window by the crew, at a location that was too high for us to reach and remove ourselves, and when we brought this to his attention in his follow up contact, he promptly returned and removed it! If you are looking for a company to do expert work on cedar siding, provide quality work and customer service at a reasonable price, David Wockenfuss and his crew are A+++. Our house looks absolutely beautiful, and we could not be any happier with the work!" They powerwashed the mold from the siding and trim of my house. They stained the cedar, painted the wood trim, and removed and replaced the rotting siding from my house. 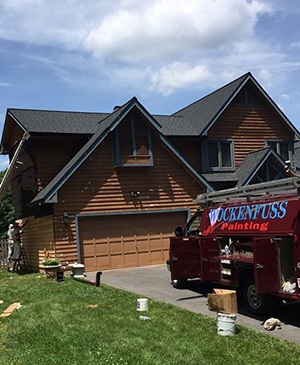 "Wockenfuss painting is in high demand within the Columbia area. Once I got on their schedule they were very professional and did a fabulous job."